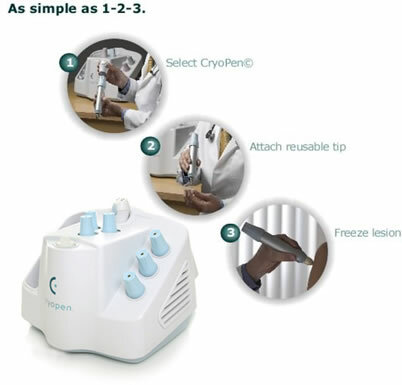 The CryoPen system provides a means of freezing tissue without the use of cryogenic liquids or gases, such as liquid nitrogen, carbon dioxide, or nitrous oxide. The system consists of hand-held freeze modules, a refrigeration unit, and reusable tips. The system will deliver effective temperatures for tissue ablation. The CryoPen system is designed to ablate tissue by the application of extreme cold temperature. The CryoPen offers physicians and patients a safer, more convenient alternative to liquid nitrogen, carbon dioxide, and nitrous oxide.